The Zoiglhaus periodically does an event called a wort share: they make the base beer and then for a fee, people can pick that up and a strain of yeast that they want, and then do whatever they like to it. More hops in secondary? Oak chips? Whatever! So I thought I’d give this a go, using Imperical’s Monastic yeast as my selection. I’m pretty pleased by how this worked out. The nose has a little Belgian peppery quality, but otherwise isn’t overwhelming. The beer itself follows up on this pepper quality on the finish. The middle of the beer has a caramel and roasted flavor happening but it isn’t cloying or sweet. The finish isn’t extremely clean-the effervescence is strong which is great, but the lingering flavors of sweetness and pepper from the Belgian yeast know how to hang out. All in all, pretty tasty though. The brew date was 8/11. The OG is around 1.054. FG was 1.009, so the ABV at 6.1%. Total IBU is around 20, which was achieved with a bittering addition of Herkules and three flavor/aroma additions of Hallertau Herbsbrucker. I added Imperial’s Monastic Belgian yeast and in secondary, 1 oz of Chinook on 9/8 and bottled it on 9/10. Here’s how I can tell I’m getting better at brewing: I’m starting to think ahead. I am trying to make beers with the notion that they will be drank at a certain time of year, in this case Summer. This beer came out sweet, a little lemony hint in the nose. 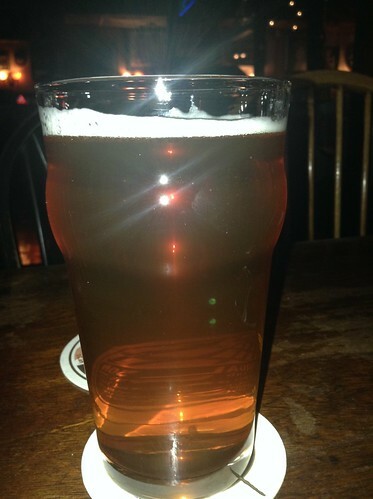 The body isn’t thin but the beer is light: it doesn’t taste watery. It’s got a nice level of sweetness in the middle before coming up with a present but not dominating bitterness. It’s pretty dang good! And it’s great for these summer days. To think: I actually planned for that. I was shooting for a lighter beer that had a bit more malt presence and by God I got it. It would’ve been smarter of me to get a picture before the beer got drank but…it’s been hot! Can you blame me? I thought about calling this the Half Full but The Half Empty trips off the tongue better. Maybe I should call this the 50/50? Every bottle I’ve opened has come out looking like this photo. Visually amazing to witness, not as much beer left to drink. 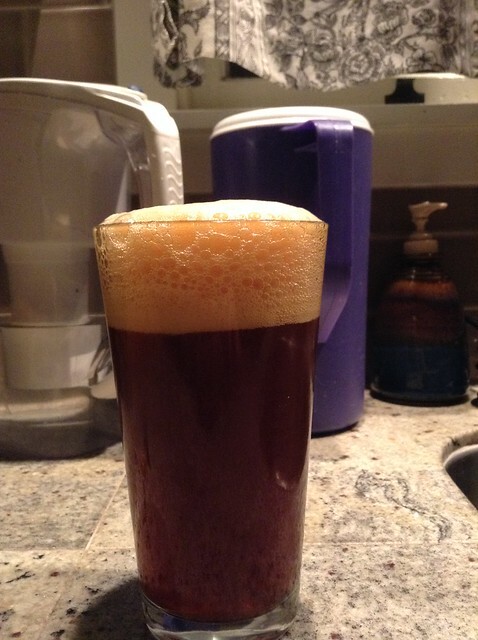 My goal was to make a Mild ale and I have to say, it is easy to drink once you can drink it. Sweeter, with a nice coffee and chocolate blend, coming down further on the chocolate side. 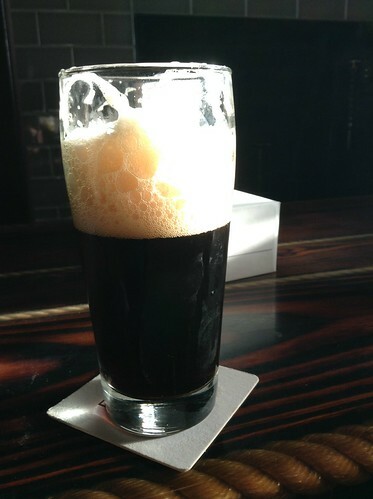 Of course, drinking too soon means chewing on foam and that’s a lot less appetizing. The finish is too bright as well; the bubbly elements of this beer wash everything out too fast and hard. It feels prickly and dissuasive of the next sip of beer. Less than awesome, that. This beer has a good malt nose; reminds me of opening up the buckets of liquid malt extract that I add to wort. There’s a hit of bitterness at the end, which I’m pretty sure is from the hops but it’s followed by a touch of chocolate. 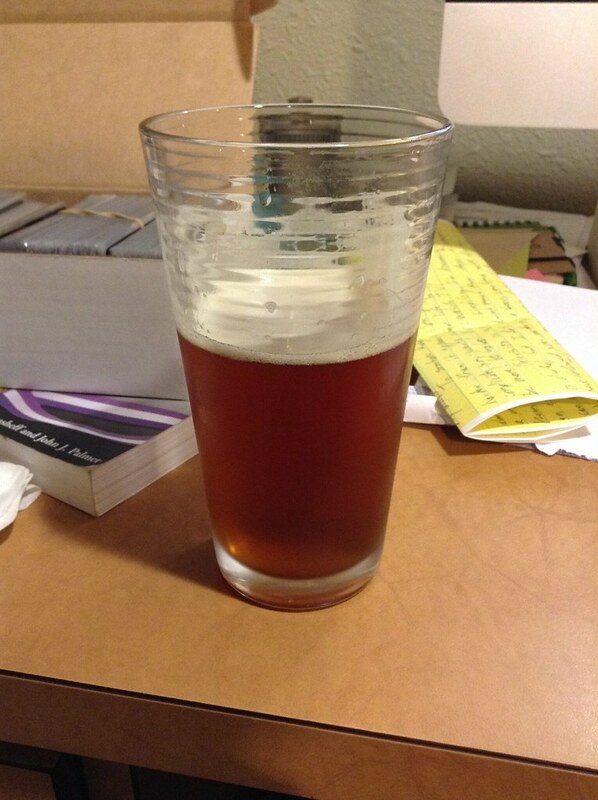 It’s not bad but it’s not really a pale, which is what my notes are trying to insist I was attempting to make. Of course, as soon as I look at my notes, I have to ask: what was I thinking? Three pounds of C120 malt is NOT going to give me a pale ale, ever. It’s too dark! I’d call it a pretty solid amber ale, though. The head doesn’t always pour that foamy, either, this bottle was just showing off for the camera. So it’s actually a drinkable beer on top of everything else. 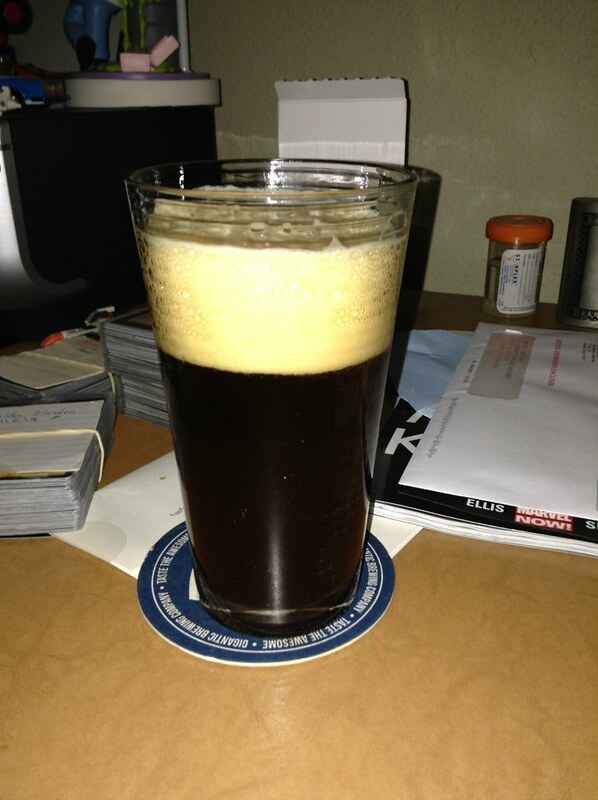 This is the ESB-ish sorta kind beer I made that Shane gave me feedback on a couple weeks ago. Personally, I more fond of this beer than Shane was. It’s malty and I’m not detecting a peanut butter quality. But there is a sweetness in the nose, something that may be what Shane was talking about? I also get a hint of the hops in there, the Chinook spiciness just under the surface. It’s a sweet beer though; malt is present and forward. However, it’s also sweet in a different way leading me to think that, Shane is right; the yeast could’ve produced some unwanted sweetness. It’s not fruity though, which is the characteristic I usually associate with yeast pitched incorrectly. I’m hard pressed to understand how to pitch the yeast at the correct time-the moment when it’s at the height of reproduction, instead of starting to eat itself, but that just means there’s more to learn. I’ve also incorporated into future beer recipes the temp at which I pitch the yeast, just as a data point. The other thing is, it doesn’t taste like a 7% beer, given how light it is. This could be because there’s a steady effervescence that runs throughout the beer: even 3/4ths of the way done, it’s still got a pretty foamy head on it and carbonation is steady. It may be flawed, but it’s certainly drinkable. The Collaborator project is a contest that Widmer and the OBC hold every year, where homebrewers submit what they feel are their most commercially viable beers for judging. It’s an interesting contest, because adherence to style is less important than the overall appeal of the beer. The winner then gets to have their beer brewed on Widmer’s small system for distribution around town! It’s a pretty cool project and I happen to know one of the winners of this year’s contest, so when they had a tapping of the beer last night at the Horse Brass, I went to check it out. I also stole a couple of moments with the brewers, Jenn and Jeremie McPolander, who were nice enough make time to tell me a little bit about the Kenton IPA they made. The story goes that they’ve been trying to make a great IPA since they bonded over the style on their first date, years ago-at the Horse Brass, no less. With the Kenton, the beer was actually an experiment between Gigantic and Hopworks ale yeasts and they happened to like what Gigantic’s yeast did a little better. The beer itself was a last minute entry but the risk paid off, clearly! When Widmer and the McPolanders went to brew the beer, Gigantic was awesome provided yeast for the beer, so they could really get what they wanted. This beer finishes very crisply. Spicy hop note, from Amarillo hops according to the notes, leading into bitterness appropriate for the style but it comes off the palate nicely. Lemon notes finish it off, with a tingle of effervescence. The malt is very subtle for me; it’s there but I have to work it between my cheeks to really pick it up. The Kenton is pushing the NW IPA angle and it shows. This beer is for hopheads. But not just hopheads! What impresses me most about this beer is how drinkable it is. I promptly want more after setting it down. It’s definitely hoppy, no question about that but it isn’t overpowering and it’s so clean that it really encourages multiple sips. I’m told this is the first IPA that has been selected for the Collaborator and it’s a worthy entry.